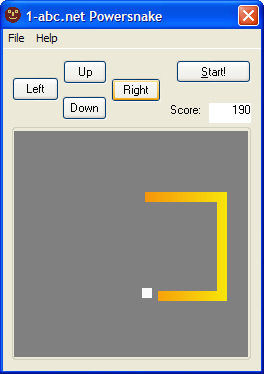 1-abc.net Powersnake - The more the snake grows, the faster it goes. Snake - who doesn't know this classical old skool fun? It's one of the first and one of the easiest computer games ever! The more the snake grows, the faster it goes. Now it's brought back to you by 1-abc.net ... This new version in XP style comes with a crazy kind of mouse control. Including high score list, snake color settings, speed optimization, savable high score list and additional keyboard control! New in version 2.3: Now 1 KB smaller and sound for more gaming fun.